Forget the mapping of the human genome, the discovery of the Higgs Boson God particle, or the invention of L’Oreal’s age defying Boswelox™, I think we here at Laboratoires Yumblog can humbly announce we have made the single greatest scientific breakthrough since our prehistoric ancestors rubbed two dinosaurs together and conjured up fire. Like many of humanity’s greatest achievements it was the result of luck, circumstance, genius, 80s post-punk pop and six pints of Warsteiner. We (being me, my co-blogger, and a friend up from that there London 2012) were sitting drunkenly around the kitchen table having just returned from a Scritti Politti gig and pondering what to eat to soak up the lager and send us off to bed to slumber like lions and dream wholesome dreams of Green Gartside. I am in do doubt that what happened next will replace the national curriculum and be the sole subject taught in schools and universities the length and width of the country. 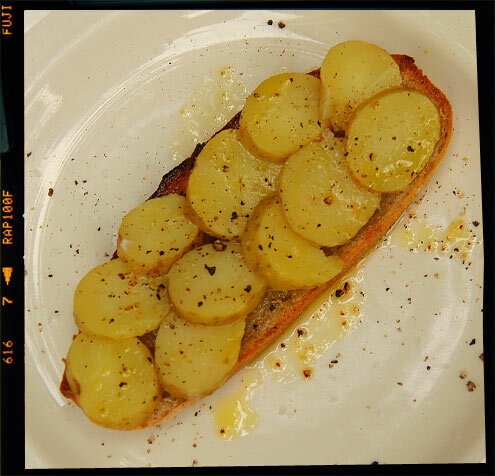 Cunningly we combined lightly toasted sourdough, left-over cold potato, olive oil and simple seasoning to produce the greatest ever post-pub, pre-bed, hangover-defying snack of ALL time. The one thing to remember is NEVER deviate from this recipe in any way. So no substituting extra Virgin olive oil with Flora Lite, Maldon salt with Saxa, and definitely use no bread other than the finest sourdough baked to this recipe. 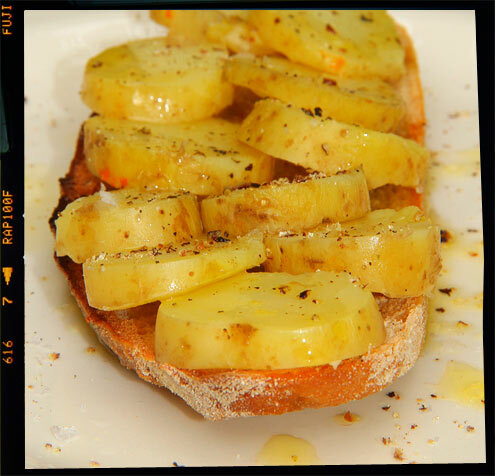 Slice the potatoes (5mm thick) and layer onto the toast. Twist over a grinding of black pepper. Yumblog Junior adds her own cheesey twist to the Pan Con Patatas. Cucumber, blue cheese, ham and cherry garnish optional. Drink: six pints of lager before, 1 mug of tea during. Entertainment: Finalising our plans for an innovative new playground-based exercise regime. The parents get a workout and their kids get the fun of being swung, pushed, bounced, chased, thrown and caught. 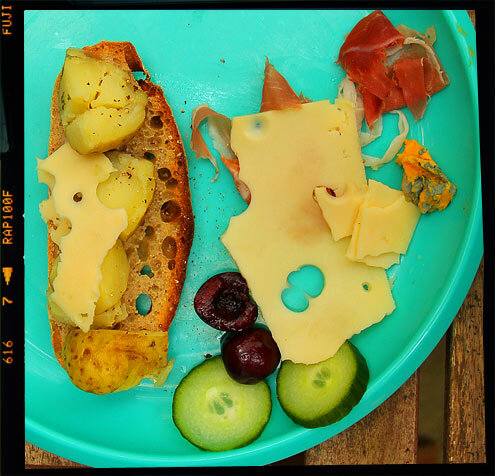 Trust me, it’s going to be the next big thing … working title … ‘Paedocise’.